This boat is from the Riley Day School at Rockport, ME. 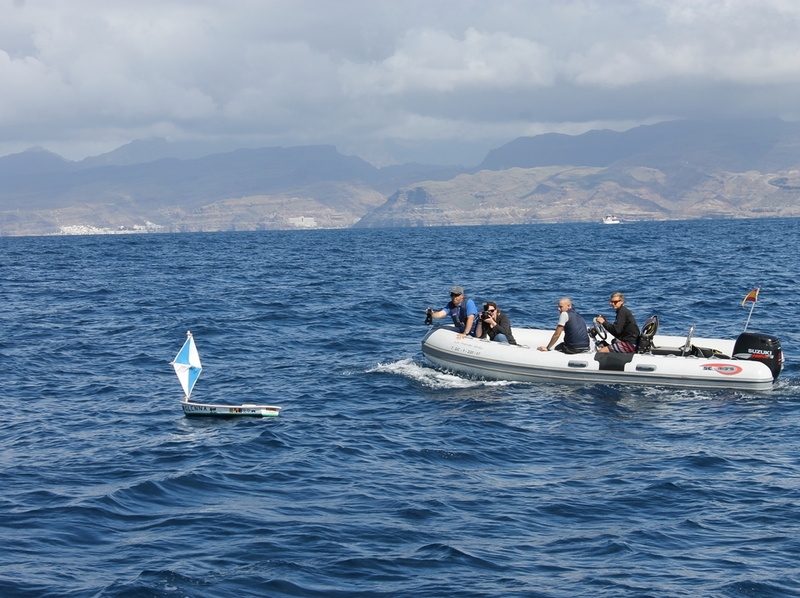 On Jan. 13, 2014, “Glenna” arrived safely at the PLOCAN research center in Canary Islands. 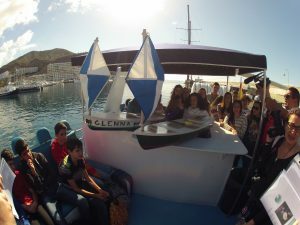 Glenna was launched alongside the Eagle by Carlos Bearrea, oceanographer and local Canary Island students on Feb 25 2014. We all expected Glenna to sail to the Caribbean but instead it headed quickly to the SW towards the coast of Brazil. It crossed the ocean in just a few months! 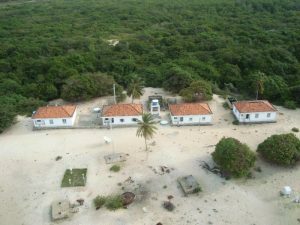 On Apr 20th, just offshore of the Ilha de (Island of) Santana Brazil it went silent for several days and then suddenly reported inland from the “Vila de Pescadores – Farol de Santana- MA” (Santana Lighthouse – Fishing Village) The next morning, we found it moved up river to a town call Sao Jose de Ribamar. We don’t know who has the Glenna today! 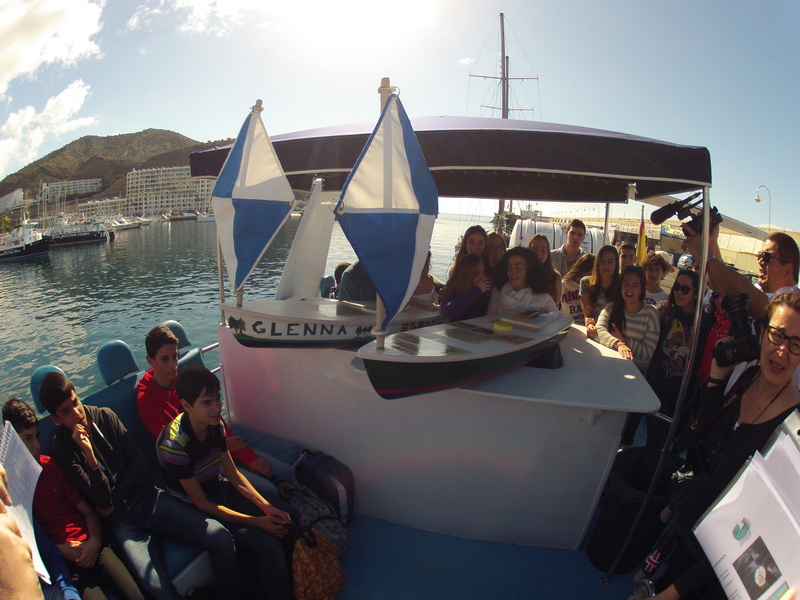 Sending a group of elementary school students from Maine to study in Europe, the Canary Islands, or Brazil may not be practical, but a group of schools in New England did the next best thing when they launched a “remote” classroom in the form of a flotilla of 5-foot model boats to do their exploring for them. These sturdy craft, launched from several sites, have faithfully sent home GPS messages that allow students and friends to track progress. What these little boats can not do, unfortunately, is to communicate the experiences they have clocked up in the course of their thousands of miles sailing alone across the Atlantic: hurricanes, 30-foot waves, beautiful sunrises and sunsets, encounters with cargo ships, nights filled with an uninterrupted view of a universe of stars, the adventure of landfall. We can only imagine. 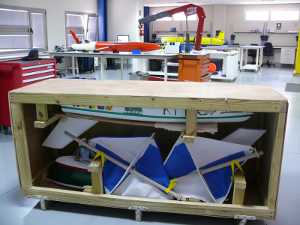 Jan. 13, the “Little Boat That Could” arrived in the Canaries via container ship, ready for launch. In February, more than 50 students from Riley gathered at Camden Public Library to participate in a three-way Skype session with students from Windham and Gorham connecting with their counterparts in the Canaries. The participants from Maine were wrapped up in coats and scarves, the Canary group in T-shirts and shorts. The children from Riley broke the ice by singing their school song and encouraging the students on the Canaries to examine the treasures in the hold of the little boat – and had the opportunity to explain how a syrup tap was used. In the process of the Skype encounter Riley children stepped forward to ask questions in Spanish with the support of Riley faculty member Nohora Estes. Sadly, the boat from the southern Maine schools stopped transmitting after a few days. 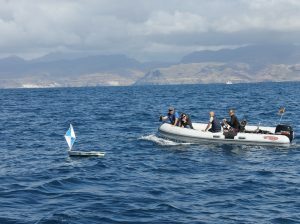 When Riley School’s “Glenna” was launched by oceanographer Carlos Bearrea off the Canary Islands, a turtle and a whale surfaced nearby to watch as the little boat gamely set sail to the west. Powered only by her small triangular sail, everyone expected her to head for the Caribbean along the trade route once followed by Christopher Columbus but, no, the “Glenna” set her sights on the coast of Brazil. 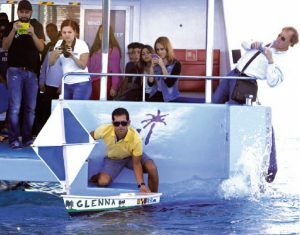 Crossing faster than any boat in the history of the Educational Passages program, the “Glenna” arrived on a remote and sparsely populated shores near on the northeast coast of Brazil two months after her launch. There were some tense moments. April 20, off the coast of Brazil, the transmitter went silent for a few days, but the boat was finally reported ashore near the Isla de Santana Lighthouse. The boat is now appears to have been transported to the small fishing village of Sao Luis de Maranheo upriver. Riley students and faculty have been scouring the coast via Google Earth, using Trip Advisor and the web to contact schools, agencies or hotels in the area who hopefully can locate and report back about the location of the boat. This little soldier of a boat brings to mind the one-room schoolhouse. Here are a vast array of subjects brought together in a way that cuts across traditional disciplines. Marine engineering in the state-of-the-art design is incorporated in these little craft; art (“dressing” the boat); understanding of weather; a history of the trade routes and those who crossed on them; oceanography; language; global relationships; and geography. The project also provide three key components of any good education: a learning experience that is fun; the sparking of the imagination beyond the confines of our own environment; and the benefit of learning through doing. One thing is for sure: for the students at the Riley School, the Canary Islands and Brazil are very real in a way they have never been before. The Educational Passages program was brought to the attention of Riley School and co-sponsored by Maine Boats and Harbors magazine. For more information on the “Glenna,” go to the Maine Boats & Harbors blog at http://maineboats.tumblr.com/ or educationalpassages.org, her travels are far from over.